When Carnegie Mellon University graduate Dean Putney (DC'11) saw his family for Thanksgiving in 2011, his mother showed him what she thought was just a family heirloom that had been hiding in his grandmother's closet. Putney's great-grandfather, Walter Koessler, was a lieutenant in the German army during World War I and had carried a camera throughout his service. 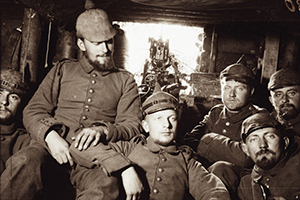 Looking at the album Koessler had made after the war, Putney recalled what he had learned in his History of Photography class at Carnegie Mellon and knew it was something special.